A Quiet Place is a newly-released horror film, starring John Krasinski and Emily Blunt, that focuses on the day-to-day life of the Abbott family. The film takes place in a post-apocalyptic world, and most of the population has been wiped out by indestructible, blind creatures that attack anything that makes noise. The father, mother and their three children have learned to live in silence in order to survive. The storyline is set up in an interesting way that kept me engaged. There is a nice balance between slower scenes that introduce how the characters have adapted to stay silent and thrilling scenes of when the characters come in contact with the creatures. Learning about each individual character’s unique struggles, specifically those of the deaf daughter, made the suspenseful scenes more interesting because I felt invested in the characters. The most unique aspect of the film is that there is almost no dialogue. Going into the movie, I was worried that this might get boring after awhile, but the suspense created by the storyline kept me interested throughout its entirety. Unlike most horror movies, A Quiet Place gave out a strong message of empowerment. Krasinski and Blunt’s characters didn’t try to shelter their children in any way, but they encouraged them to participate in daily activities, such as fishing and venturing into a nearby town, that educated them on survival tactics, even though they could possibly be put in danger. 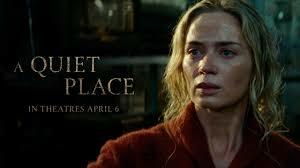 A Quiet Place is the best horror film that I’ve seen in a long time. Although it wasn’t the scariest movie, it actually had a real storyline that made me connect with the characters and become more invested in the movie. Overall, I would give this movie a 5/5.